If you're looking for a new challenge and you want to take your fitness to the next level, our CrossFit program gives you the tools you need to get there. Do you want to look better? Feel better? Have more energy? Tone up? Lean out? Build muscle? Burn fat? The fitness industry is littered with these kinds of words. Why? Because that's how people talk when discussing their fitness goals. And, in an ultra-competitive space, people do their market research and learn to use the words that their customers use. The trick is that it's one thing to use a list of key phrases gleaned from market research, and it's another thing to truly deliver results. And, although there's a lot of bad information out there and a lot of silly gimmicks, the truth is that most fitness programs probably do actually work (almost anything is an upgrade from a typical American lifestyle)…provided people follow them. What's missing for most folks isn't the perfect workout plan, or a dialed in macronutrient ratio. It's steady, consistent effort. It's, to paraphrase Dan John, showing up, not quitting, and asking questions. Now how do you get that? You have to care. You have to be held accountable. Your training has to be fun. We have a community of like-minded people working towards their goals, which means that we show up when life gets crazy, we ask questions and learn from each others' experience, and we make lots of steady progress with occasional "big wins." 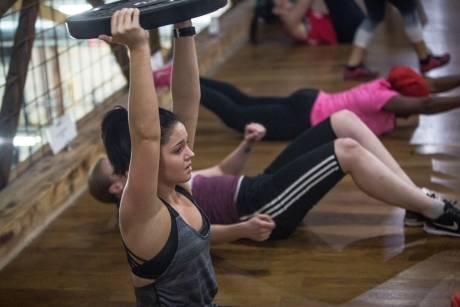 Our group classes offer tiered programming for different fitness levels and goals. It's not as simple as just "scaling" one workout of the day for everyone. Some people want to win and others just want to look a little better and have more energy at work. This needs to be addressed in the program design, and our different tracks reflect those pieces. 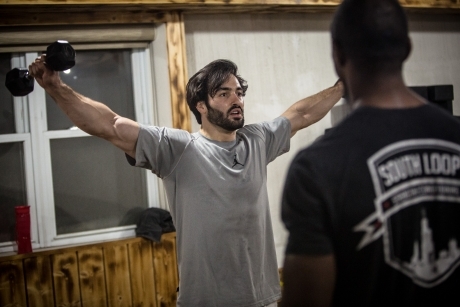 We offer programming for fitness, performance, and competition. Similarly, some people have been lifting weights for 10+ years, and some have never touched a barbell. There needs to be different strength progressions in place for these two individuals, as well as an upfront assessment process to guide people to the best program for their goals and abilities. Another key component to our group classes is the coaching. Almost everyone in our modern world suffers from information overload, and the best coaches are capable of distilling this information into top priority, actionable cues. Let's use an example of a basic movement pattern that's actually quite difficult for most of us: the squat. I know when I first tried to squat, I tipped over backwards immediately. It took months of practicing using a doorknob as balance to be able to truly get into a below-parallel squat. The squat requires so many different things of the body, and inadequate mobility or stability through almost any joint can make it nearly impossible? Is it the ankle? Is it the hip? Is it the low back? The upper back? Impossible to say, but a good coach will be able to triage these issues and give guidance. And, the truth is, maybe all of the above need some work. But, if you're not breathing properly, I know I probably want to start there. To get started with our group classes, we require everyone to go through our Elements cycle to learn the fundamentals of technique on the primary lifts we use, the feeling and goal of different types of training sessions, and to learn what kinds of weights and intensity are appropriate for you to get started. If you're interested in our Elements program and our group classes, click here to schedule a consultation with one of our coaches. Looking for accountability, fun and challenge? Most bootcamp-style programs rely on cheesiness and gimmicks - as well as a lot of fluff and instructors who are more focused on their playlists and their cheesy motivational sayings than the actual technique, progression, and understanding of the clients in their classes. High intensity programs like our CrossFit classes can get people great results, but there's a significant focus on intensity, heavy barbells, and competition that is simply too much for a lot of folks who are interested in getting started - and, to be honest, it can be pretty intimidating. So, what's someone to do who wants serious training based upon timeless principles developed by the best coaches in the world? But who is not necessarily interested in pushing their body to the limit, maxing out their clean & jerk, or pushing to the point of potentially vomiting after a workout? Our FAST program is focused on building resilient, fit bodies so that our clients can use their fitness to whatever end they see fit. Some people want to make significant changes in their lifestyle and reclaim their health - and we have several stories of dozens of pounds lost. Some people want to make themselves more resilient so that they can do the activities they enjoy in life without fear that their fitness will let them down - like play with their kids, go for jogs on the lakefront path, join a rec sports league, or carry groceries up a few flights of stairs without feeling a bit more exhausted than is reasonable. Some of our CrossFit athletes use the program as a supplemental work to their higher intensity training, since the philosophy of FAST focuses on utilizing the component parts of movements to make the whole stronger. And - we also have football players, track athletes, and soccer players who use the program to injury-proof their bodies for the unpredictable demands of their sport. This program is for people who are willing to work hard and put themselves in uncomfortable places. Sure, the training is hard, but we teach all movements from the ground up and design workouts both for beginners and for people with significant training experience. If you're looking for serious training without the fluff - and without the focus on heavy lifting and competition - come check out our FAST program and see what it's all about. Many people are trying really hard to get fit and wasting their time. People are in the gym to Do you want to look better? Feel better? Have more energy? Tone up? Lean out? Build muscle? Burn fat? And, at this point, most people have heard of CrossFit. Most fitness advice on the internet is unrealistic and insulting clickbait that does much more to drive outrage and surprise than it does to get you in shape. So why come to SLSC? We have a relentless focus on best practices in training and coaching - which means that our primary concern is making sure that you actually get better every time you come into the gym. Some people come to us looking to get better - but that's not the reason most people are in the gym. There's the old adage that the person in the hardware store isn't looking to buy a drill - they're looking to buy a hole. People get caught in tactical hell - endlessly researching things, randomly trying them - but never actually committing to anything to see if it works for them. Training can make you look good - who cares if its shallow. But, more importantly, training can improve your ability to focus throughout the day. Feeling groggy in the mornings and struggling to even focus long enough to send an e-mail is not normal! No one should go through life underperforming and feeling frustrated. Often just missing some key steps along the way - and you need a coach to help you find what you're missing. A cornerstone of any weight loss program is a solid fitness routine. While you can't out-train a bad diet, you can maximize your results in the gym so that you can stay on track with all of the habits necessary to change your body. FAST is a circuit-based class with intervals of continuous movement where you work on each piece at your own pace. Movements and skills are taken apart and each individual component is trained so that the whole becomes stronger when the individual parts are improved. You can use your fitness to do whatever you want - walk on the lake, play with your kids, join a rec sports league, or just go up a flight of stairs without getting out of breath. Our program gives you the tools to live your life without restriction. There's something special about people who purposefully choose to do something challenging day in and day out, and we find people form tight bonds and friendships in our group classes. In order to keep joints healthy, we have to keep them moving - and we have to apply the correct amount of stress with proper technique. Our coaches are focused on helping you move well so that you develop proper technique. We've taken the best training principles from a variety of disciplines to put together a program that is fun, engaging, and varied - while simultaneously offering continuous progression in the most important training areas that build resilient bodies. Prevent injuries and improve movement patterns while making joints more resilient by improving your control through different ranges of motion. Develop coordination and agility by focusing on good running mechanics - and recruit fast twitch muscle fibers through sprinting drills. Train in intervals with work to rest ratios that increase aerobic capacity – meaning you can do more work while getting less tired. Use your own bodyweight as resistance in order to improve muscle endurance and body control. Learn to control your body in space and move athletically through plyometric drills. Proper core stability is the foundation of all good movement. Build the muscle endurance and the motor control necessary to maintain good positions in all movements. "I had never worked out. I didn't have a sports background. I just started getting compliments all over the place." You'll meet with one of our expert coaches and discuss your background and your goals - and you'll also go through a movement screen and try a short workout. Consistency is the precursor to results. If you can train consistently 3x per week for several months, you will be astonished at the progress that you can make. Most people overestimate what they can accomplish in 1 month and dramatically underestimate what they can accomplish in 6 months. No need for this to be the perfect time or for you to worry about starting on the exact right day. We'll get you into a class since trying FAST is the best way to understand what it's all about. "The things I do in FAST I look at as tightening all my joints back up and making sure I'm structurally sound. 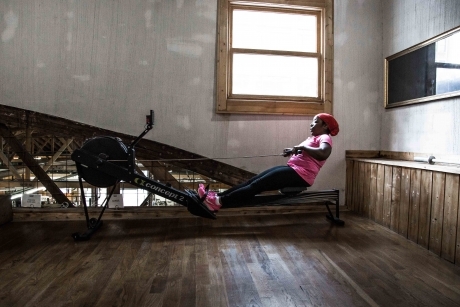 I can add [FAST] to any day or every day [of training]." Nope. While our training is challenging, it is infinitely scaleable and modifiable. Even if you've never worked out before, our coaches are highly skilled and able to find the "sweet spot" of appropriate challenge for all experience levels. Our community is also very supportive, and everyone starts somewhere. Don't worry that you'll be the "slow one" in class or that people will be judging you. Everyone is primarily focused on their own training and - in the nicest way possible - they don't really care that much about what you're doing! What's the difference between CrossFit and FAST? Our CrossFit program is focused on developing fitness across all kinds of different capacities - including strength, conditioning, gymnastics, speed, and power. CrossFit uses a lot of high power output conditioning, barbell-based strength work, and gymnastics movements to achieve these goals. CrossFit can be a bit intimidating, and the intensity of CrossFit isn't always appropriate for people on a daily basis. FAST is an interval-based class focused more on building up the component parts of bigger movements - so that we can build resilient bodies that can handle the stress of higher intensity training, as well as build the fitness necessary to do whatever you want to do outside of the gym. While there may be some similarities between FAST and CrossFit in terms of some of the exercises that we use and the interval-based nature of some of the conditioning training, you will see many more isolation movements, core movements, and pre-hab/rehab movements in FAST - as opposed to the higher volume of barbell movements and gymnastics movements used in CrossFit. What if I can't do certain movements? All the movements that we do in FAST are infinitely modifiable and scalable. If you struggle with a certain movement, our coaches know how to make it appropriately challenging for you. If you have movement restrictions, our coaches know how to swap movements out with other movements that will give you a similar stimulus. If you have pre-existing injuries, check out the next question below. Injuries are pretty variable, and it's somewhat irresponsible to offer blanket recommendations for injuries on a website. That said, it's often beneficial to continue training and moving as much as possible - provided you aren't exacerbating potential injuries or movement issues. We also do an upfront movement screen on our members to hopefully uncover any potential issues with movement that could put someone at risk for problems down the line. Most of our members do one of our monthly unlimited memberships. We have options for both month-to-month memberships and memberships with a 6 month commitment. We have folks who do both our CrossFit classes and our FAST classes, and we do have a separate membership rate for people who only want to our FAST program. If you're curious about our rates, you can learn more here. There's no such thing as a perfect time, and you'll learn more and get more out of coming in to chat with one of our coaches than you will in hundreds of hours of continued research. Besides, your first consult is on us. That way, you can find out if we are who we say we are (since we know lots of people have been burned by disingenuous marketing in the fitness industry in the past). And, if you show that you can show up to your consult, you'll know that you can show up to get your training in. All we can do is create the environment, write the program, and offer coaching - after that, it's on you to show up and find consistency. Come see what it's all about. DON'T WAIT FOR THE PERFECT TIME TO GET STARTED.